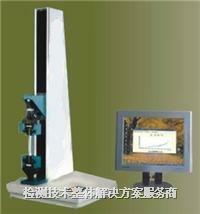 Senior usb strong machine, special apply to various material strength test, low cost and high performance. T-shaped head movement revealed readings accurate to 0.001 mm, absolute t-shaped head position accurate to 0.001 mm. Precision ball screw and guidance system, high precision closed-loop speed controller, bio-fuels device and optional quick return, microcomputer RS232 interface, fixed load and travel protection restrictions, real-time loading and tensile cycle testing, long-term creep test. Digital control sample damage detection function, back automatically and without a mechanical tension state test position, automatic detection calibration function, impact protection, optional automatic reset, and automatic back to zero. This machine can cooperate with various fixture test various materials tensile, bending, flexural characteristics; And can depend on the test of materials and demand, select suitable for the form, capacity and function. Leather detachment (IVF470 / BS 6453, ISO 11644, BS 3144), leather viscous tear (DIN 53331 BS 5131), zipper clip, BS 44mm wide) 3084,6,12 25.